Markets are increasingly complacent as we approach the widely telegraphed - and yet skeptically embraced ECB rate hike. 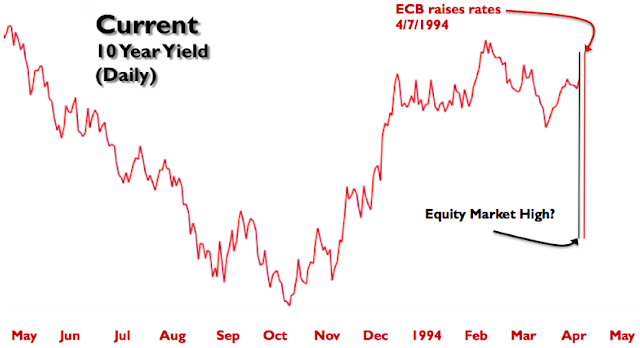 In many ways this is reminiscent of the market dynamic in 1994 - except the ECB is playing the lead role of inflation hawk. Whether vigilante justice ensues in our treasury market remains to be seen, but that is another wind potentially working against us going forward. In keeping with my prior trade framework as the S&P 500 returns to its February highs, I have initiated a few positions. A pair trade that maintains a long position in the S&P 500 (SPY) and initiates a short position on the Transportation Index (IYT). This could either be a hedge on your long portfolio or just a trade. You might be wondering why I perceive an ECB rate hike as a positive towards the dollar here. Well its as simple as the dynamic in cards where a player calls another's bluff and forces the hand. The ECB will take on that role, if they choose to raise rates tomorrow and strengthen the call for the Fed to follow suit. It also plays to the fact that the market typically buys the rumor and sells the news. We could see that develop tomorrow with the Euro. A much more aggressive position would be to short the IYT and SLV while maintaining a long position in the dollar.